This is a question that gets asked a lot around here, and for good reason. With so many business owners struggling to get their posts in their fans’ news feeds, everyone wants to know the “magic” or “optimal” time to post. A quick Google search will reveal a number of “perfect” days and times. For instance, according to Hootsuite’s research, the best time to post is 12-3 pm on Mondays, Wednesdays, Thursdays and Fridays, or 12-1 pm on the weekends. But what happens if you DO post during these times, and still don’t get the reach you’d like? Is it possible there is no one-size-fits-all day or time that’s right for every business owner? I would argue that it’s not only possible, but probable. As you likely already know, coming up with the perfect time to post is confounded by Facebook’s news feed algorithm. When you post something on your page, it needs to compete with all the other posts in your fans’ feeds…including posts from their family and friends. In order to show users the posts they’re most likely to WANT to see, Facebook limits (or boosts) your reach based on a number of factors. These factors include how your fans have interacted with you in the past, how popular your post is, how recently you posted, etc. Add to this that every Facebook audience is unique in terms of age, lifestyle, location, habits, etc., and you can see why this becomes so complicated! This is why I encourage page owners to stop looking for a universal “optimal” time and instead, investigate what works best for THEIR business. Who is most likely to interact/engage with our posts? What are they interested in, and what kind of lifestyle do they lead? And ultimately, WHEN are these people most likely to see and interact with my posts? This post will help you answer these questions so you can find the “perfect” time to post for YOUR audience! Want to know exactly when your fans are most likely to be on Facebook? 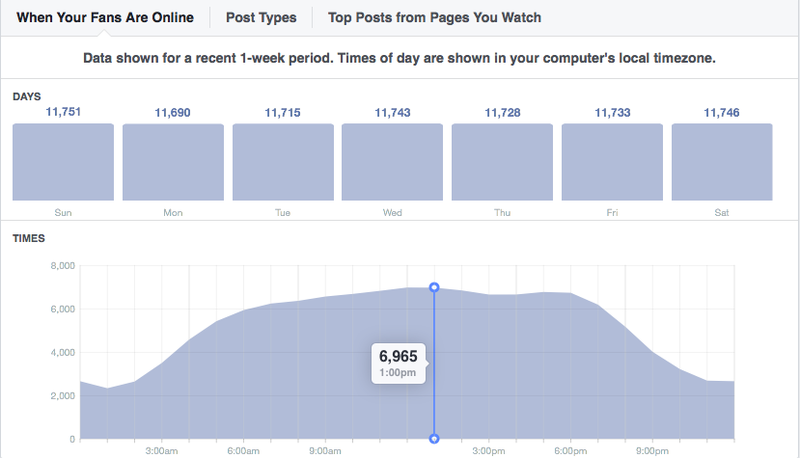 This is easy to figure out using your page Insights. Simply click on ‘Posts’ within Insights, and then ‘When Your Fans Are Online”. This will then show you the days and times that your fans have been online over the past week. In the example below, you can see that the numbers are very similar for each day of the week. According to Wiselytics, this is the case for nearly every Facebook page. In terms of times, we can see that the greatest number of fans are online at 1:00 pm. Given this information, many business owners assume they’ve determined the optimal time to post. They think that posting at that time will give their posts the best chance of being seen. What they don’t consider is that this is also the day and time when their posts will be facing the highest levels of competition. As your fans log on, they’ll likely be posting personal updates. They’ll also be looking through their feeds to see updates from their friends and family. And I hate to break it to you, but those personal updates are likely more important to people than your page posts! So, instead of relying on THIS info to guide your decision, you’ll need to take things a step further. 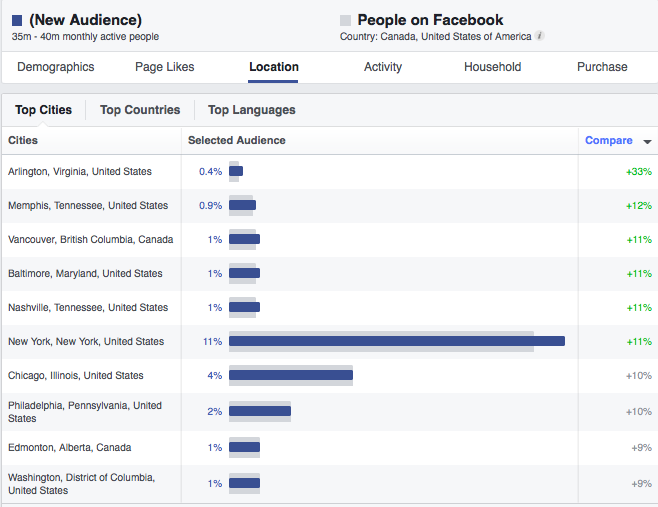 In your Facebook Insights, go to ‘People’ to get a feel for the demographics of those who have liked your page. This section will give you some general info on your fans, including gender, age and location. Of course, getting this info for the fans who are actually liking, sharing and commenting on your posts is even more important. To see this, simply click on ‘People Engaged’ at the top of the page. This should give you a good starting point in understanding who is most likely to interact with your posts (i.e. your ideal target audience). At this point, you should know the basic demographics of your most engaged fans. 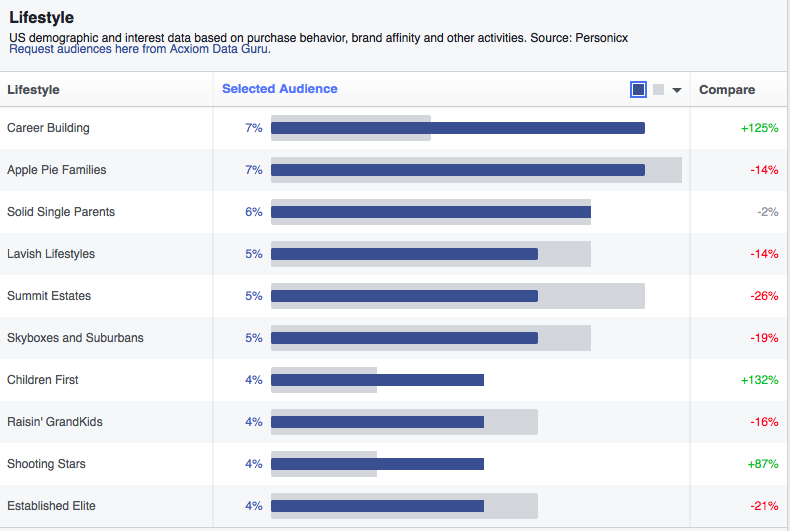 However, using Facebook’s Audience Insights, you can really take things to the next level! All that info you just got? Plug it into the left sidebar. For instance, if you know that women between 25-34 are the most engaged with your content, enter that info in the appropriate fields. Then select ‘People Connected to Your Page’ (see screenshot below). This will now allow you to see a bunch of info for this specific segment of your audience. There are countless ways you can use this information, but there are two sections I find most valuable for determining the optimal time to post. Go to the ‘Location’ tab and click ‘Top Cities’ or ‘Top Countries’. This will help you determined which time zones your most engaged users are in. In the example below, you can see that 11% of my selected audience (remember, these are my most engaged fans) are in New York. This will help me plan my updates to coincide with when my fans in the Eastern Time Zone are likely to be awake and online. Under ‘Demographics’, you can glean info like relationship status, lifestyle and job title. This data can give you insight into when these people are most likely to be active. For instance, a high percentage of “Children First” under Lifestyle means your fans tend to have small children. Since these parents may be more likely to be up early with their kids, this could give you a window of time to test. And since this isn’t generally a high-traffic time, your posts will likely have far less competition. This means your most engaged users are more likely to actually see your posts! Obviously, none of this information is explicitly stated here. But with a little bit of common sense and deductive reasoning, you can figure out some great times to start your testing. 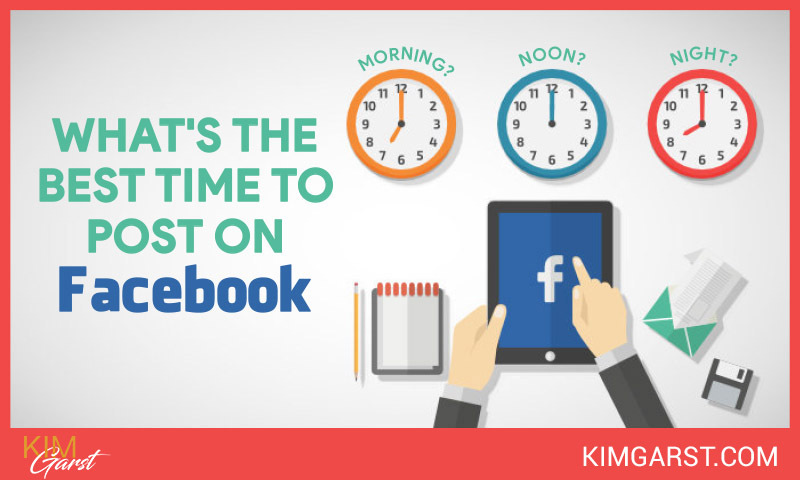 The question we started this post with was, “What’s the best time to post on Facebook?”. The short answer is it depends on your audience. While this may not be the answer you were looking for, the tips above should give you a good place to start testing what’s right for your business. Have you figured out what time works best for your audience? How did you figure this out? Share below! Hello Kim, Just wondering if you have ever used any of the Auto-Scheduling features inside of Hootsuite or Buffer? I like being in the know about best times to post to Facebook, but always wonder if an automated scheduler can do it better? Any experience with using these tools? Yes I have used both and I also like Sprout Social. Great post! Thanks so much for all the great information you have shared this year that has helped us all! Merry Christmas! This must only be available on our FB page? This is written for those who have business pages, yes. Hi Kim, That’s really an informative article. I was looking to find out something on when should we post on Facebook. Your article made me understand a lot of that in a simple way. Keep up with this form of posts. Very valuable tips. I read in another post about featured image. I am using Astra theme. Featured image was showing at the top above title, I tried customizing and found the theme have the option to put title first and then featured image as read in your post. Thanks for the tips.